Chicago has some new bragging rights when it comes to public parks and public space. Among the cascade of openings of public places this year—The 606 Trail opens on June 6 and the official opening of Maggie Daley Park will be this summer—is the much-anticipated opening of the Chicago Riverwalk. The city takes a huge step forward with the construction of this three-and-a-half acre, six-block area of new public space along Wacker Drive from State Street to Lake Street. Speaking to an eager audience at the Chicago Loop Alliance “Leadership Forum: The Park Effect” event on May 6, Michelle Woods, project manager of the Chicago Department of Transportation, described how an Act of Congress and cooperation with the US Coast Guard and Army Corps of Engineers were required to build the additional fifteen feet of land that extends into the river to create the twenty-five-foot-wide Riverwalk, with seven vertical feet allowing for annual flood dynamics. The buildout transforms a narrow ten-foot passage interrupted at each bridge into a continuous six-block walkway. CDOT is directing the design and construction of the project, expected to cost $100 million. The Chicago Riverwalk has been decades in the making. The Vietnam Veterans Memorial, between Wabash and State Streets, dedicated in 2005, was designed by Ross Barney + Jankowski Architects. In 2009, CDOT completed the first phase of the Riverwalk buildout at Michigan Avenue and Wabash. In 2012, to design the blocks west of State Street, CDOT and Carol Ross Barney, now of Ross Barney Architects, brought in the Boston design firm Sasaki Associates, who worked on riverfront projects in Cincinnati and Indianapolis, as well as Alfred Benesch Engineers, and Jacobs/Ryan Associates, landscape architects. The firms were charged with reviewing best practices across the country, including waterfront projects in New York City and San Antonio, especially practices regarding ADA access, to ensure the CDOT project met or exceeded them. The first room, Marina Plaza, between State and Dearborn Streets, is lined with a row of elegant, high-backed wooden seating, as well as seating at the river’s edge. Commercial space will open for outdoor dining and drinking. The Cove, between Dearborn and Clark, has stepped concrete seating, or “river stones,” and is designed for rentals and docking for kayaking and other human-powered watercraft, such as paddleboats. The River Theater, from Clark to LaSalle Streets, with the dramatic feel of an amphitheater, austere as well as intimate, will allow audiences to view floating performances or just relax in the shade. The slope of the ramp leading into and from the room allows for easy access with strollers and wheelchairs. From LaSalle to Wells, the Water Plaza will feature a shallow wading pool for children and families. The Jetty, from Wells to Franklin Streets, will include a series of piers and floating wetland gardens that provide an interactive environment for learning about river ecology and native plants, and for fishing. The Boardwalk, the final section between Franklin and Lake Streets, is larger—fifty feet of continuous walkway and vertical connection with Lake Street. For the near future, the Boardwalk will be a place to enjoy lush plantings as well as programmed events. As the Riverwalk evolves, CDOT will explore possibilities for developing the Boardwalk. Some forms of commercial activity might be considered to support the considerable costs of maintaining the Riverwalk. CDOT has also approached the US Department of Transportation for funding through the Transportation Infrastructure Finance and Innovation Act (TIFIA) program. RBA and Sasaki collaborated to create the vision for the six rooms, ensuring a continuous material palette. Sasaki was the lead design firm for the Marina Plaza and Cove. RBA designed the River Theater and the stainless steel walkways under the bridges, and is responsible for the Water Plaza. Sasaki is designing the Jetty. RBA originated the concept of the Boardwalk in the master plan; Sasaki detailed the final design. Over the Memorial Day weekend, the Marina Plaza and Cove were unofficially opened to the public. 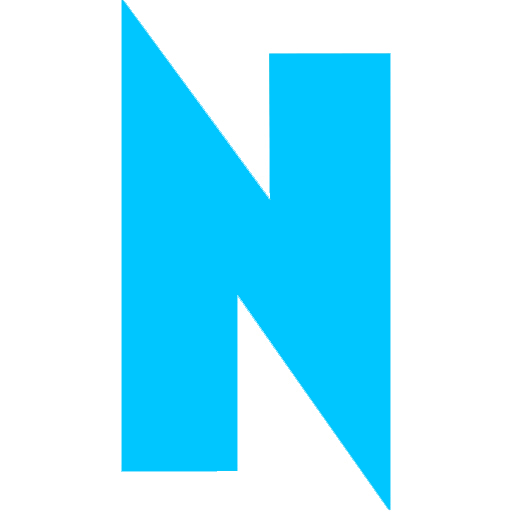 The official opening will coincide with the opening of the River Theater on June 16, during NeoCon. Construction on the Water Plaza, Jetty and Boardwalk will begin as soon as the River Theater is completed. The last three rooms will open in 2016. During a recent phone conversation, Gina Ford, a landscape architect and principal and chair of Sasaki Associates Urban Studio, spoke of the excitement of working on the project, of experiencing something entirely new in the Chicago River canyon, with hulking metal bridges, stacked up one after the other, that contrast with ornate copper-clad bridge houses. The Sasaki team considered ways to combine the city’s history and ambitions to provide an interesting and intriguing cultural and recreational amenity; and ways to infuse each room with a different character. The existing Memorial space was civic and stately. Marina Plaza, the Cove and River Theater have a personal, residential quality; the Water Plaza and Jetty are playful. I visited the Riverwalk during the week before the opening, on the first day that spring weather came and stayed. It was late in the afternoon, and I descended the staircase at Wabash, leaving the rush of traffic and jostling pedestrians. This new, subterranean-like place was quiet and serene, and as I came toward the first bridge heading west, I was struck by a view I had never seen. The bridge created a darkened passageway, a frame through which late-afternoon sunlight filtered, shimmering gently above the river. In the distance, at eye-level, a single, golden-yellow barge appeared on the horizon. It was a timeless moment of wonder and mystery. On Saturday, the first day of the unofficial public opening of Marina Plaza and the Cove, I stepped off a bus on Michigan Avenue and made my way south across the bridge to Wacker Drive. It was a holiday weekend, another warm sunny day, and Michigan Avenue was alive with people and the fantastic musicality of voices speaking languages I didn’t recognize—all of which I had experienced just days before in Millennium Park, but there was something different about the atmosphere. In front of the Wrigley Building and in the area just west of the bridge on Wacker Drive, where impromptu street performers attracted crowds of passersby, there was a light-hearted, almost carnival atmosphere. Making my way along the same route on the Riverwalk, but going further west to Marina Plaza and the Cove, I encountered people I felt I had never seen, not because I didn’t know them, but because I didn’t know them in this place. Their expressions seemed at once focused with attention to new sights and new views, and diffused with the sensory pleasure of experiencing water, sun, fresh air and leisure, and the community that comes with a sense of place. The sleek, tawny benches in Marina Plaza were full, and people sat along the water’s edge, eating and chatting. They watched people fishing and tossing back the fish. At the end of the walkway, just before the River Theater, people stood in small groups, talking about the city along the river: about what had been and what is to be. The meeting of water and land creates a powerful dynamic. The shore is a place where we refresh and launch new beginnings. The coast is a boundary that contains and protects, presents and defines us. We know this about our lakefront. 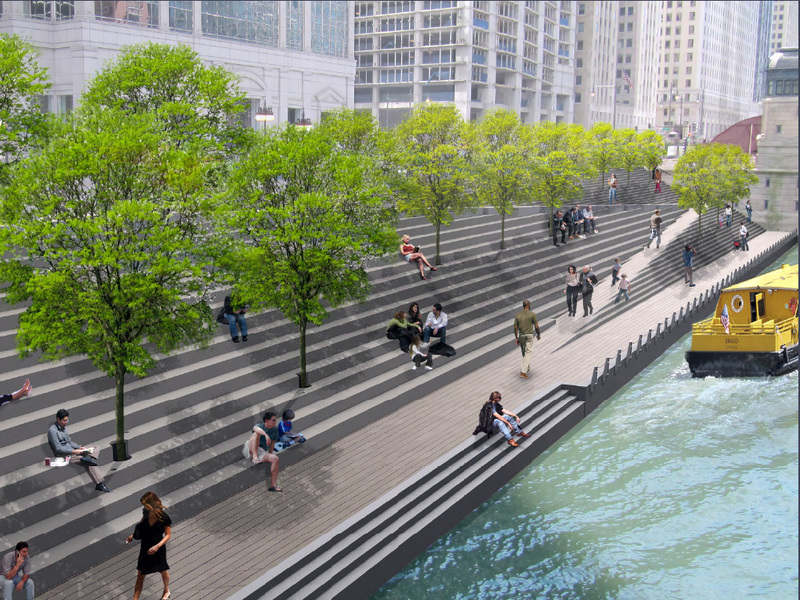 Now, with the Riverwalk, we will have, as Mayor Emanuel has predicted, a second lakefront. With the mayor’s backing and the support of area residents and visitors, Michelle Woods, CDOT, and the Department of Fleet and Facility Management will continue to create and recreate the Riverwalk through public art, temporary and permanent installations, programs and events, and through new, planned development of the Boardwalk. I’ve read a few grumbling complaints: vendors are not yet operating to serve that delightful destination glass of wine. The Riverwalk ends abruptly and the rooms lack signage. Let’s be real: a city-building public project of this magnitude is complex and takes time. Let’s look forward to witnessing and participating—and enjoying—as the Riverwalk evolves and becomes what it will become, physically, and as an experience. What you can expect to see are what some have dubbed “Michelle’s Woods”: maples in Marina Plaza and shade trees in tiers on the Riverwalk Theater, planted in deep tree trenches that support healthy growth; variations in the height and angles of walkways within each section that create visual interest and a heightened sense of space; and cutout seating areas, in Marina Plaza and the River Theater, so people in wheelchairs can be seated next to their companions. Better still, go without expectations. Show up to see Marina City against the sky from twenty-five-feet below street level. Look at the silhouette of Chicago architecture from the Jewelers Building to the Hard Rock Hotel. Walk underneath the massive, industrial bridges as they thunder and rumble, and gaze at their rugged, sculptural beauty. Come on a weekend, when glossy-white river cruise ships ferry tourists back and forth and back again, as passengers gawk at and tour guides hawk the city’s architectural monuments. Then come again during the week, at sunrise or sunset, when it’s just you and a few locals running and sunning, when humble golden-yellow water taxis glide quietly along to their destination. For more information about the development of the Riverwalk, check out the video from Sasaki Associates at www.vimeo.com/106294236.